The surface of an ocean biome. Ocean is a primary biome type characterized by a vast expanse of water with small scattered sandy islands. Traversing the surface is best done with boats or by swimming. The ocean floor is covered with plantlife, breakable shells, and possibly submerged ruins. Ocean planets are a 'risky' threat level, geared toward tier 3 in progression. Ocean planets can be found orbiting temperate (orange), radioactive (yellow) and frozen (blue) star types. They also have a rare chance of being found around fiery (red) stars as satellites of gas giants. There are no environmental hazards in ocean biomes which require use of an environmental protection pack aside from deep oceans which can drown players not using a Breathing EPP. The water found on ocean planets is infinite, and cannot be drained. All air below surface level is replaced with water. To build underwater and not have water spawn inside your structure, you must replace the background and foreground with blocks, then remove the foreground blocks and water will stop spawning. Ocean water also cannot be converted into other liquids, such as poison. Pouring poison onto water will normally result in the conversion of the water into poison, however, pouring poison onto ocean water results in the poison disappearing with no effect to the ocean water. 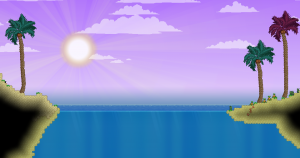 By creating a box with foreground blocks, placing background blocks inside of the box, and then removing the water and replacing it with healing water, and then removing one background block, it is possible to create a healing water generator, as when removed, the water flowing in through the background is transformed into healing water. Ocean planets are ideal for constructions which may require an infinite source of water, like liquid converters or automated crop watering. Crabcanos, Lilodons, Monopus, Snuffish and Snagglers all have a chance of being found in ocean biomes. Hylotl structures Hylotl Underwater City and Hylotl Underwater Ruins are the only settlements found on ocean planets. A planet of deep oceans and small islands. My readings indicate that aquatic life is abundant and that the islets of the surface are extremely picturesque. An ocean covered planet spotted with islands and teeming with life. My readings indicate that there is a great deal of activity in the depths of the waters. Floating desert islands pepper the surface of this ocean planet. An environment of tropical ambiance and aesthetic. The surface layer of oceans is primarily made up of water with small scattered islands made from sand and sandstone. Commonly these islands have palm trees which can be harvested for a few wooden logs and coconuts. Ocean planets are mostly covered in water which spawns endlessly. There's no way to gather all of the water found in oceans. Ores can be found on surface islands, with of copper, silver ore, gold, titanium and tungsten available in small quantities. Most ore is accessible beneath the ocean floor. Ocean surface biomes use the Day Tracks during the day and the Night Tracks during the night. Ocean floor biomes use the Day Tracks plus both Arctic Exploration tracks during the day and the Night Tracks during the night. Ocean planets do not have any sub biomes which appear, and oceans do not appear as a sub biome on any other planet types. There are no mini-biomes found on the surface or underwater in Ocean biomes. Ocean planets do have two "biome levels" though, the ocean surface and the ocean floor. Each have their own distribution of drops, materials and crops. Ocean planets deviate somewhat from planetary standards due to being ocean-type planets. Note: For ocean-type planets, the surface layer begins at y=1050 and the ocean surface is at y=1150 regardless of planet size. Ocean biomes also have some tree resources available like coconuts and kelp which can both be reharvested from replanting palm trees and kelp saplings. In addition to procedurally generated creatures, there are a variety of unique monsters, bugs and critters found in ocean biomes. Some of these are also found in other biomes, while others are unique only to ocean biomes. While these unique creatures have a chance to appear on ocean planets, they will not all appear on each one. In addition to unique creatures, each biome has multiple types of both procedural ground and flying creatures. There are a number of fish which can only be caught on ocean planets using a Fishing Rod. These fish won't be seen swimming in the wild without a fishing lure to attract them. Catching each of these fish will complete their entries in the fishing collection screen. There are a variety of items which are specific to chests found in ocean biomes. Some of these may have a chance of being found in other places throughout the universe, but they've all been specifically allocated to chests within ocean biomes. Ocean biomes have two treasure pools, one for the surface and one for the ocean floor. There are a variety of items which can only be found in one area, but not the other. Ocean surface treasure can be found on the small islands which are scattered across the surface of the water. Ocean floor treasure can be found in chests along the ground at the bottom of the ocean. While a number of the items found in ocean floor chests are diving masks, they're purely cosmetic and don't actually provide the player any protection from running out of breath underwater. Some objects found in ocean biomes are tagged with the object tag ocean. There are no tenants associated with the ocean object tag. Oceans only have a chance to have two settlement types appear. They're both Hylotl; an underwater dungeon and city. There are also a variety of small friendly dwellings which can be found on scattered islands on the ocean surface. Note that Hylotl surface cities and ruined castles do not appear on ocean planets. Broken Stone Pillar Decorative 60 A broken stone pillar. Cactus Pot Decorative 50 An exotic-looking cactus in a flower pot. Fiery Flower Decorative 50 A fiery-looking flower in a pot. Floor Ornament Decorative 55 It's some sort of floor ornament. Frog spawn swirls inside. Glowing Oshroom Light Source A glowing oshroom. Glowing Oshroom (2) Light Source A glowing oshroom. Glowing Oshroom (3) Light Source A glowing oshroom. Glowing Oshroom (4) Light Source A glowing oshroom. Glowing Oshroom (5) Light Source A glowing oshroom. Large Bongo Decorative 75 A bongo drum fashioned out of leather and wood. Large Overgrown Geyser Decorative 90 A large geyser, covered in plant growth. Large Volcanic Geyser Light Source 80 A small volcanic geyser. It's lighting the area faintly. Ornate Wall Block 0 A traditional looking wall. Sitting Log Decorative 90 A log, smoothed for sitting on. Small Traditional Table Furniture 85 A delicately designed wooden table. Stone Pillar Decorative 55 A tall stone pillar. Traditional Gong Decorative 195 Hey, this gong has a big chip in it... oh. Oh, I see. It's a lily pad. Traditional Shoji Screen Decorative 120 A screen for modest individuals to hide behind while getting changed. Wooden Dressing Screen Decorative 120 A wooden screen, perfect for dressing behind.